We’re all born of pregnancy, yet the area of perinatal research and medicine is a Cinderella discipline, says Professor Louise Kenny. Louise Kenny is a Professor of Obstetrics and Consultant Obstetrician at Cork University Maternity Hospital (CUMH) and the Founding Director of Metabolomic Diagnostics. The company is collaborating with University College Cork and the CUMH in the development of groundbreaking predictive pregnancy diagnostics. The technology, a cumulation of 15 years of research, is the world’s first metabolomic-based early pregnancy screening test for pre-eclampsia. The condition which affects 5% of first-time mothers, is a leading cause of more than 70,000 deaths globally each year and is responsible for around a fifth of neonatal intensive care occupancies. Metabolomic Diagnostics has 10 employees of which five are senior scientists. Louise is also the founding Director of the Science Foundation Ireland (SFI) funded Irish Centre for Fetal and Neonatal Translational Research (INFANT), Louise’s research group is supported by more than 30 million euros (€30 million) of peer reviewed funding and employs 100 staff. And now she can add the WMB Woman in Technology Award 2017 to her list of accolades! We interviewed Louise recently for our annual WMB Magazine, in particular focusing on her work with INFANT which we’d like to share with you. She really is a woman who means business. The term perinatal, explains Professor Louise Kenny, covers the period from conception through to the baby’s first few weeks of life. It’s a period of time which is crucial for two reasons; the first of which is that the complications that occur during this period to mother and baby account for about 10% of the global disease burden which is “absolutely huge,” she says. And secondly, as she observes, this period in the life continuum has not just attracted surprisingly little research attention, it also gets a fraction of the R&D funding directed to tackling other, similarly formidable disease burdens. Contrast, for example, the approach of the scientific community to the HIV/AIDS virus and to the potentially fatal condition, pre-eclampsia, which occurs in the perinatal period. As a teenager in the early 80s, Kenny recalls, she began to hear the first, isolated reports of the deaths of gay men in the US from a then-unfamiliar disease – HIV/AIDS. Less than four decades later, she points out, science has effectively triumphed over this formerly lethal virus: “We now have a huge array of novel drugs that are effective with AIDS. It is now possible to say that if one has a timely diagnosis, lives in a high resource setting and has access to the right drugs, a person with HIV/AIDS can have a near normal life expectancy. “In 2017 there is no screening, test, no real care plan for women with pre-eclampsia”. However, she points out, in the same three-and-a-half decades, millions of women and babies have died of perinatal conditions such as pre-eclampsia (PE), a disease the world has known about for thousands of years – in fact, since the time of Hippocrates, the famous Greek physician who died in 370 BC. 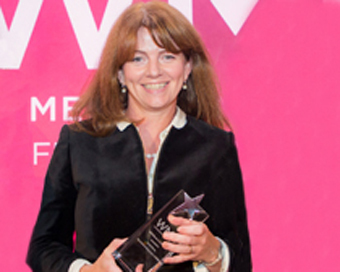 (Pictured: Dr Louise Kenny, Founding Director of Metabolomic Diagnostics receiving the WMB Woman In Technology Award at Dublin’s Shelbourne Hotel on October 2nd). This interview was originally published in the WMB print magazine and has been updated to include Louise Kenny’s award win.